A comprehensive solution for transport stream capture and re-transmission through simple timeshift or scheduled playout with comprehensive compliance monitoring and logging and live video workflows. Capture your MPTS or SPTS and save them as individual full/native resolution single program transport streams for easy search and export. 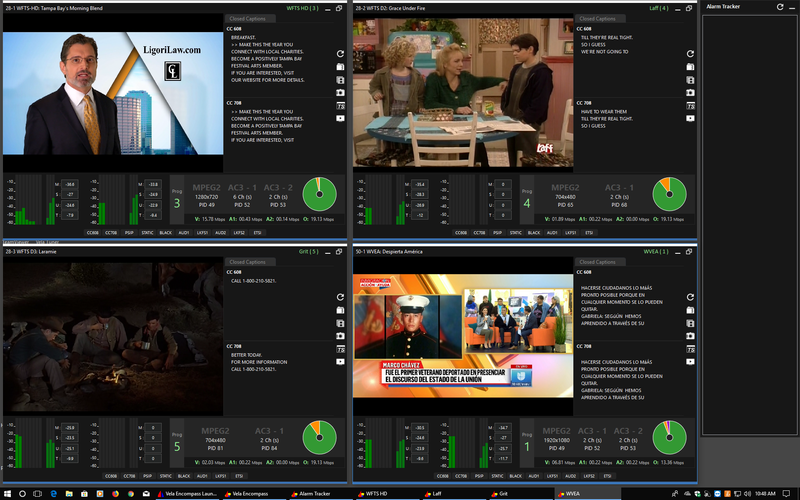 Each stream is transcoded into a low res proxy for easy playback, review, segmenting, and download through a web browser. Rebroadcast via ASI, IP, or SDI with programmable timeshift or scheduled playout. Monitor transport stream parameters per ETSI TR101.290, with 24x7 monitoring and logging of Loudness/LKFS per ATSC A/85 CALM Act, 24x7 monitoring and logging of 608 and 708 closed captioning, PSIP logging and loss of PSIP detection, black screen detection, loss of audio detection, and ratings watermark detection and logging with configurable alarms and thresholds on each parameter within each stream. Create clips in real-time from live broadcasts. Send us your configuration details for our Titan Diaster Recovery System for a customized quote. Search, trim, and distribute original Transport Stream content or transcoded content for redistribution, ad placement, and "As Aired" confirmation using web-based remote access and automated processes. Access to video for viewing/editing. Grant users access to original and low resolution proxies which can be searched, recalled, played, reviewed, edited/segmented, and downloaded through a web browser. Full resolution content available for reuse. Full resolution content captured, stored and logged as single program transport streams for easy search, recall, and export for editing, transcoding, and repurposing. Monitor physical layer integrity, Transport Stream QoS, and various audio/video QoE parameters. ETSI TR101.290 Level 1,2, and 3, Black Screen detection, Static Image Detection, and PSIP detection and decoding. Comply with mandated regulations and company policies. Meet all of your compliance requirements with Encompass 24x7 monitoring & logging capabilities. This system monitors and logs all CC608/CC708 Closed Captioning, Loudness/LKFS per ATSC A/85 specifications, ETSI TR101.290, black screen detection, PSIP detection and loss of audio detection information. Alert key personnel via email, SMS text, push notifications, and SNMP traps. Each communication is configurable based on alarm type. Customize alerts to best suit your communication requirements. Use security feature to grant access to features and functions. Manage users and permissions with Active Directory integration or customizable security features. Rebroadcast captured content using programmable timeshifting or full-featured 24/7 365 scheduling software. Scheduling Software allows operators to quickly and easily build daily and weekly schedules. Operators can be trained to use the software in minutes. Easily import playlists created from the Vela Playlist Builder, WideOrbit, and other third party traffic and billing systems. TS capture and re-transmission with programmable timeshift or scheduled playout. Real time viewing of captured/monitored channels. Configure thresholds for audio amplitude levels, audio LKFS values, closed captioning, MPEG data, black frames, PSIP data, and Nielsen data. Automatically send email/SMS text alerts to operators, engineers, and managers when monitored parameters exceed thresholds. Send SNMP alerts. Easily searchable database to recall alerts, alarms, Closed Captioning text, Loudness measurements, PSIP, and Nielsen information. Search by channel, date, time, program name, and keyword text. Easily create and edit video log files for compliance and advertising verification. Burn in or overlay timecode onto video output for As-Aired verification. Create a daily log of the pass/fail state of all monitored parameters with all events date and time stamped. Log date and time stamped instantaneous and average LKFS measurements every 500 msecs. Logs are organized by date allowing for easy retrieval of data when necessary. Plenty of storage, with enough room for years of compliance logs. Log date and time stamped decoded 608, 608 embedded, and 708 Closed Captioning for proof of compliance and record keeping. As in all other logs, the Closed Captioning logs are organized by date for quick and easy retrieval of data when necessary. Easily graph LKFS values using the exported log file CSV format in the spreadsheet application of your choice. Insert upper limits to quickly and efficiently demonstrate compliance in a graphical format. Provide proof of Closed Captioning, LKFS, and PSIP compliance using log files, graphs, and snapshot tools provided by the Vela monitoring system. Connect to and administer on a network with an easily integrated and managed Windows 7 Professional based platform. Easily configure email settings and transfer files to other work stations or NAS. Field upgradable. DVB-ASI Full 213 DVB-ASI Receiver. Option for more tuners available.